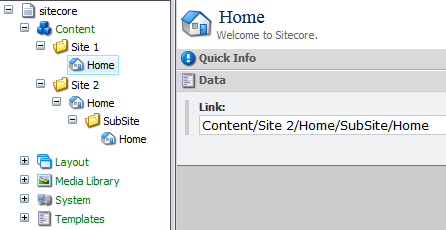 URLs are not generated properly when Sitecore.Context.Site is null (e.g. when trying to generate URLs in a HttpModule). Although this is logical, an automatic fallback mechanism would be helpful, instead of having to provide UrlOptions manually. Cross-site URLs are only generated properly when using markup crunchers like ”LinkProvider.ExpandDynamicLinks” in e.g. rendering pipelines. 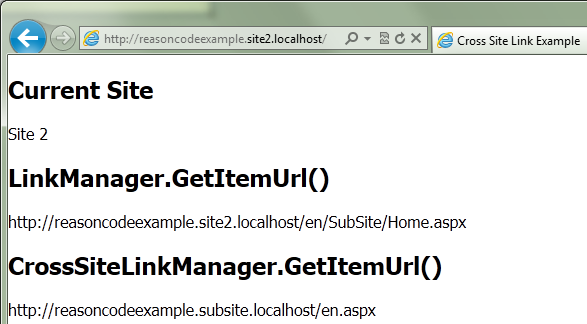 When calling ”LinkManager.GetItemUrl” cross-site links are not generated properly. When accessing ”LinkManager.DefaultUrlOptions” (which in turn calls ”LinkProvider.GetDefaultUrlOptions()”), the value of ”UrlOptions.SiteResolving” is always false, regardless of the Web.config settings. 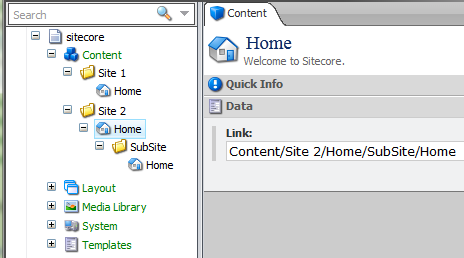 Examples are based on Sitecore CMS 6.5.0 rev. 120706 (6.5.0 Update-5) and .NET 4.0. A LinkProvider-implementation which attempts to address the outlined problems is provided below. 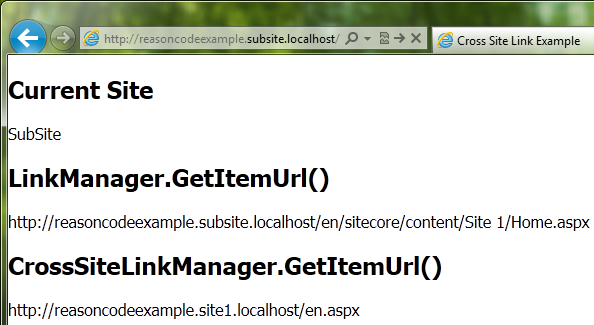 // Currently the "SiteResolving" property isn't initialized in the Sitecore implementation. To replace the standard LinkProvider with the custom implementation, copy the markup shown below into an configuration file (e.g. 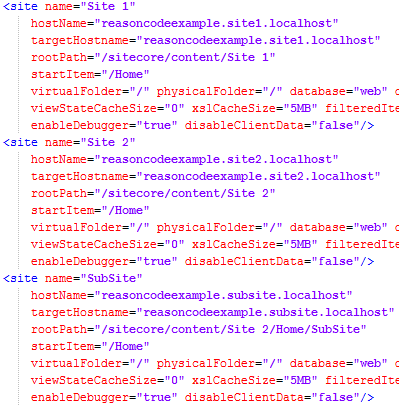 “CrossSiteLinkProvider.config”) and place it in the “[webroot]/App_Config/Include” folder. 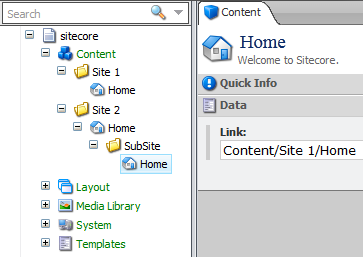 Shown below are a series of screenshots displaying a very simple two-site setup with an additional “subsite” (e.g. a campaign landing page or similar). 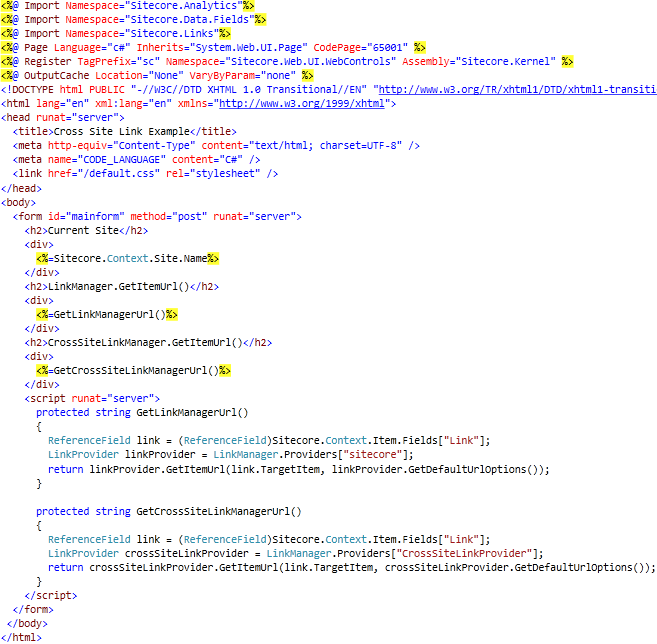 This entry was posted in C#, Sitecore, Sitecore 6.5 and tagged internal links, item links, item references. Bookmark the permalink.